Caring for our family members, friends, and others is a central part of a rewarding life. For those in healing and helping professions such as medicine, nursing, education, psychotherapy, social work, ministry, and the military, the potential for a meaningful way of being may even become more possible. But, compassion is not easy. At times, concern for others can be personally devastating when we don’t possess the right attitude and approach. Reaching out (and reflectively within) without being pulled down requires the wisdom that only arises out of the right combination of humility and knowledge. Purposely brief, the chapters, as well as the sections in the “personal resiliency retreat” section at the end of the book, have as their goal a reconsideration of values, signature strengths, and simple approaches to living a resilient, rewarding life. 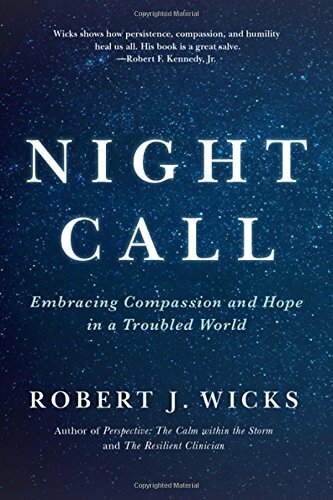 Rather than presenting new breakthroughs, Night Call is designed to dust off what most of us already know, at some level, so we can freshly view the key approaches and techniques that provide increased psychological self-awareness and a potentially healthier sense of presence to others. The themes offered may have been forgotten, or become undervalued/set aside because of some of society’s dysfunctional norms or unhelpful family influences. In response, this simple, countercultural book combines the value of essential self-compassion with caring for others in ways that provide the impetus for further exploration of a fuller narrative for both the readers of this work and unforeseen opportunities as well for those who are fortunate enough to cross their paths.